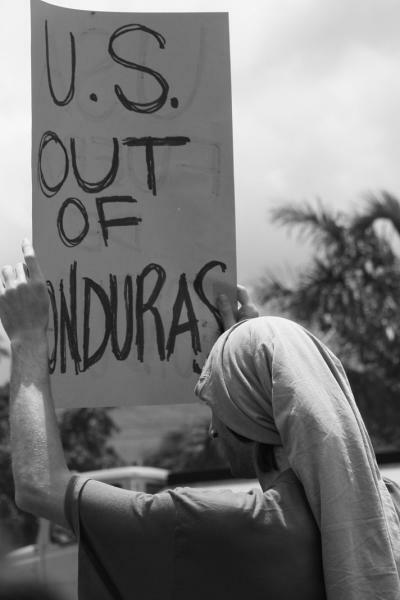 The “International Gathering against Militarization, Occupation and Repression in Honduras” (Encuentro Internacional contra la Militarización, Ocupación y Represión en Honduras), which took place June 27-28 in La Esperanza in the department of Intibucá, Honduras, ended with a peaceful protest against foreign military presence in the country on the second anniversary of the coup d'état which took place in Honduras on June 28, 2011. 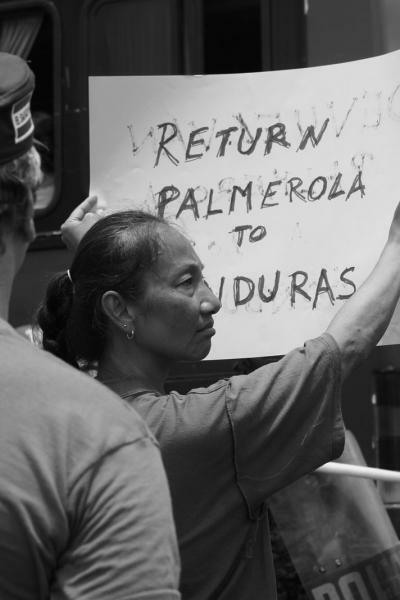 The Gathering was convened by social movements and human rights organizations including MUCA, COFADEH, COPINH, OFRANEH, CEM-H, Insurrección Autónoma, Artistas en Resistencia, ERIC, and the Latin American and Carribbean Campaign for a Region of Peace: Out with Foreign Military Bases,” and hosted participants from El Salvador, Brasil, Colombia, Costa Rica, the United States, Italy, Spain, Mexico and Honduras. 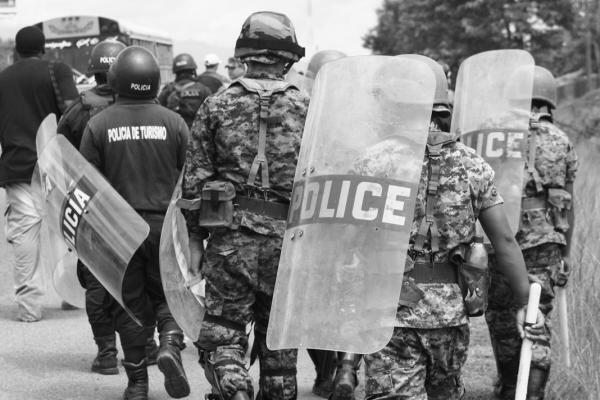 Despite the fact that the over 200 participants in the protest carried out their actions in a non-violent manner, physical altercations between the uniformed National Police and protestors occurred. 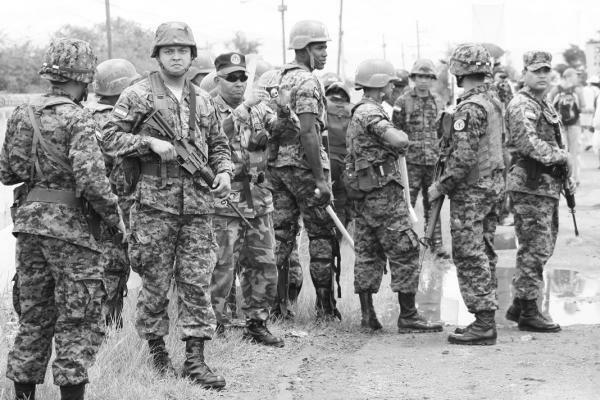 The protest took place in front of the Soto Cano (Palmerola) military base near the city of Comayagua. When the protestors were approaching the main entry of the base, some young people separated themselves from the crowd and attempted to spraypaint the walls of the base. Uniformed National Police launched tear gas cannisters at the young people and hit them several times with their batons. Uniformed officers also drew their official weapons, chasing after and pointing them at the young people and other demonstrators. In spite of these excessive show of force against the demonstrators, the national and international participants in the protest resumed their non-violent march and denounced loudly the abuse of power and aggression by the security forces, both military and police. 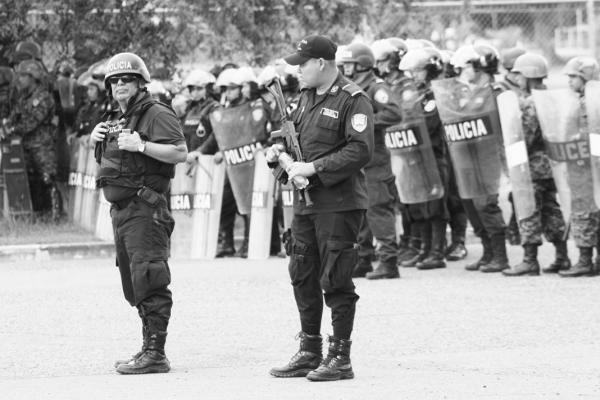 The Honduras Accompaniment Project (Proyecto de acompañamiento internacional en Honduras - PROAH - in Spanish) observed uniformed National Police, Transit Police and Air Force units taking pictures with digital cameras and Blackberry phones, as well as apparently videotaping, the demonstrators and international accompaniers throughout the protest. 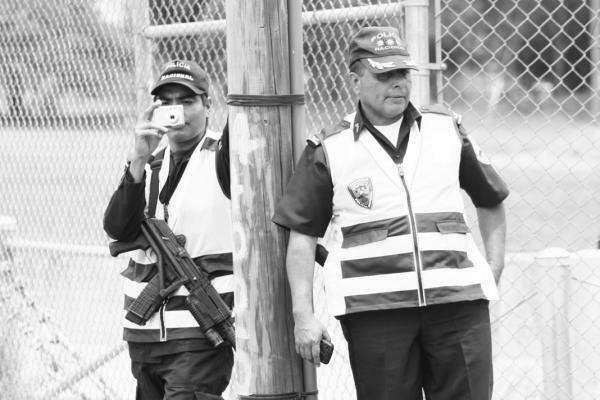 Tourism police were also observed as part of the uniformed contingents, as well as uniformed soldiers from the base who carried shields reading “POLICE” in English. 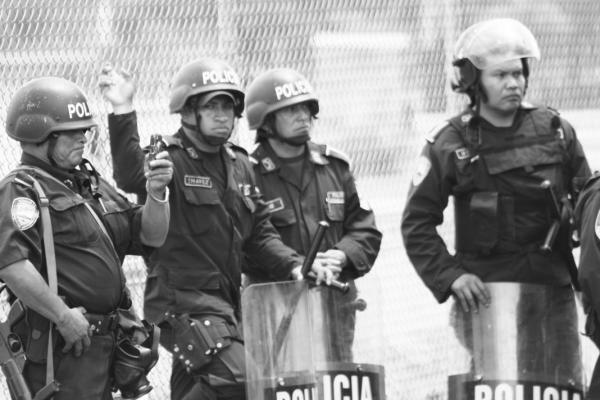 International accompaniers with PROAH who travelled with the participants of the Gathering from La Esperanza to the Soto Cano military base (and later on to Tegucigalpa) also observed at least two police blockades on the highway carried out by uniformed Transit Police who were stopping buses along the highway. 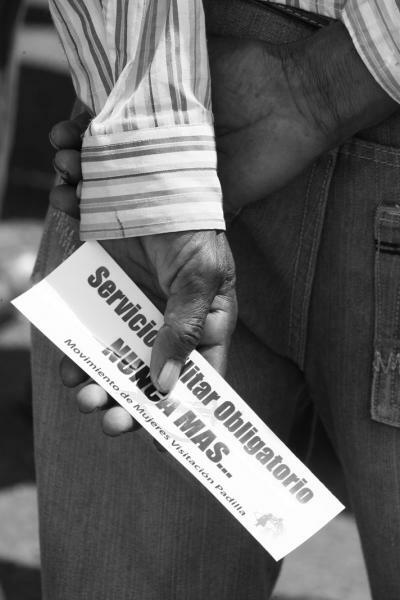 The bus that accompaniers were traveling on along with participants from the gathering was stopped just before reaching the intersection near Siguatepeque. All passengers were required to get off the bus and the men were physically searched, presumedly for weapons. No weapons were found on any of the passengers searched on the bus.